Bulgaria and Romania are set to fail their biggest test since their accession on 1 January 2007 with the forthcoming publication of crucial progress reports on the reform of law enforcement. Romania faces unprecedented criticism because of suspected attempts by its new government to ease democratic checks and balances, while Bulgaria faces more heat over alleged close ties between government officials and organised crime. Romanian Prime Minister Victor Ponta was in Brussels yesterday (12 July), a day after his Bulgarian counterpart, Boyko Borissov, was there for meetings with EU officials. Ponta's leftist Social Liberal Union (USL) wants to oust conservative President Traian Basescu. It won a majority in Parliament to suspend him and Basescu now awaits a referendum on 29 July that could lead to his removal him from office. The Ponta government has also issued a string of emergency decrees, raising concerns that it may be skirting constitutional checks and balances and backsliding on its democratic obligations. European Commission President José Manuel Barroso last week called Ponta to Brussels to discuss “actions that appear to reduce the effective powers of independent institutions like the Constitutional Court”. Ponta ignored a decision of the Constitutional Court which had ruled that he could not represent Romania at the recent EU Summit. He has also issued an urgent decree, approved by the government on 4 July, stating that opinions of the Constitutional Court are no longer mandatory for parliamentary decisions. The new Romanian premier also replaced chiefs of the chambers of deputies and the Senate, together with the ombudsman and Constitutional Court judges. German conservative MEPs went as far as to ask that Romania be sanctioned under Article 7 of the Lisbon Treaty. An EU state found in violation of Article 7 can result in suspension of voting rights in the Council. Make integrity a political priority. Ponta purportedly told EU leaders that everything his government has done complied with the country’s constitution, pledging to reverse some decisions if they were in violation of the Union’s standards. Ponta also did not schedule a news conference but did attend a packed press conference with the leader of the Party of European Socialists, Sergei Stanishev, and fielded a few questions. Speaking to the press alongside Stanishev, Ponta said that he came to Brussels to meet the leaders of EU institutions and European political parties in order to say that his government is committed to respect all European standards and values. “Romania will not be a new case of concern for its European partners,” he said. Stanishev said the PES behind for Ponta and blasted the European People’s Party of using language, which he called “tabloid” and “not based on real facts”. He accused the EPP of double-standards, recalling that the centre-right political group had remained “completely silent” about laws approved by Hungarian leader Viktor Orbán’s Fidesz party that also were criticised as chipping away at democracy. Asked by EURACTIV to comment on the quality of democracy in Romania, Ponta said much of the reports were incorrect, but admitted that there was a problem. “You are right, there were people appointed politically and maybe we should [enforce] in the constitution the stability of functions which are not politically appointed. So I agree with you that having a sort of national convention and changing the constitution expressing very clearly which are the political functions and which are not, will help democracy,” he said. EURACTIV asked Stanishev, who is a former prime minister of Bulgaria, if he feared that his country could be prevented from joining the Schengen border-free area, because of the current political tension with Romania. Stanishev said there were clear rules and criteria for Schengen accession, which were actually reached both by Bulgaria and Romania. “It is not democratic, fair, it is not consistent, to add any other political or other conditions,” Stanishev said. The issue of Bulgaria and Romania’s Schengen accession is expected to be on the agenda of a Justice and Home Affairs ministerial meeting in September. However, judging from various statements made recently from politicians, the events in Romania are likely to shelve this issue indefinitely. Although less visible from a Brussels perspective, political developments in Bulgaria suggest that both Bucharest and Sofia should expect little good news from the report under the Cooperation and Verification Mechanism due to be published on 18 July. The Supreme Judicial Council in Bulgaria yesterday fired Judge Miroslava Todorova who gained reputation as the strongest critic of the body, which is widely seen as an instrument of politicians and of Interior Minister Tsvetan Tsvetanov. Borissov called the move “a provocation” aimed at undermining the efforts of his government to improve its image. The Todorova case illustrates the ongoing power struggle between the executive and the judiciary in Bulgaria, with each accusing the other of serving the mafia. But Borissov himself threw fuel on the fire, saying during a meeting with bloggers that a taped phone conversation where he is allegedly heard speaking of the need to "protect" a controversial businessman from customs check was genuine. Last year, Bulgaria experienced an avalanche of leaked wiretaps which first targeted the country's interior minister, Tzvetan Tzvetanov (see 'Background'), and now focus on Borissov. The wiretaps were apparently made by DANS, the country's national security agency, but were then leaked to Galeria, a tabloid with connections to Alexei Petrov, a controversial figure described by many as Borissov's most powerful enemy. According to one of the tapes, Borissov instructs the country's customs chief, Vanio Tanov, to stop investigating a controversial businessman, Mihail Mihov, owner of a beer factory, stating he had "made commitments" not to harass him. On 30 March 2011, Mihov, 47, was found dead in a hotel room. His widow too died in May. According to unconfirmed reports, the European Commission was extremely concerned by tapes, in which the prime minister himself admitted having ordered the “protection” from customs checks of the businessman. Commission spokesperson Mark Gray said that the EU executive was fully aware of the wiretapping allegations, but could not independently assert if indeed the prime minister had admitted that his statements were true. "We have deep concerns that the diplomatic wording used by Mr. Ponta during his visit in Brussels this week will not be matched by concrete actions from his government. We fear that upcoming events in Romania over next weeks will justify our deep mistrust even more. The Romanian government, which came into power under strange political circumstances, has yet to show any tangible proof that it respects the rule of law; the diplomatic lip-service of the last 48 hours by Mr. Ponta is not enough to restore the credibility of his country in the European Union. “Finally, as stated explicitly by the ruling of the Constitutional Court of Romania, the referendum of 29th July will be valid only if the absolute majority of registered voters participate in vote. The government must respect this ruling, if it wants to be taken seriously," Martens and Daul said in a joint statement. In a statement, European Liberal Democrat and Reform Party President Sir Graham Watson MEP said it almost beggars belief that the leaders of the European People's Party are criticising the political developments in Romania. "Was it not the same EPP who backed Berlusconi when he rode roughshod over the rules of Italy's politics? Is it not the same EPP now supporting Borissov and Saakashvili playing fast and loose with the rules of democracy in their countries? And did the European People's Party's MEPs not give Viktor Orban a five minute standing ovation in Strasbourg despite his anti constitutional antics?" he asked. "Europe's Liberal Democrats are not surprised that President Basescu has lost the confidence of the people of his country. We call on the new government to act scrupulously within its constitutional powers to restore respect for the constitution. We suggest moreover that all parties come together in a convention to reach agreement on a code of good conduct for the government of the country. With Senate President Crin Antonescu having taken office of interim Head of State, I am confident that correct procedures will be followed in respect of the Constitution,” Watson added. 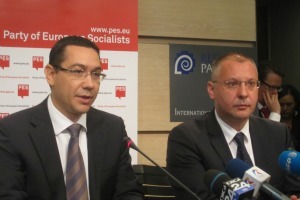 Sergei Stanishev, Party of European Socialists (PES), underlined that; “Victor Ponta is simply redressing the democratic imbalances that have taken place under the previous government." "His commitment to the highest democratic standards is clear. Victor has already indicated his willingness to immediately ask the Romanian Parliament to implement, were the European Commission to make any recommendations,” Stanishev said in a statement. On 13 September 2010 EU countries decided to extend monitoring of Romania and Bulgaria for another year. On 20 July 2011 Romania and Bulgaria were again given one more year before the Commission tabling "appropriate proposals". Dnevnik, the EURACTIV partner in Bulgaria: ??????? ?? ???????????? ?? ???? ????? ?, ?? ?????? ?, ???? ?? ?????? ?? ????? Dnevnik, the EURACTIV partner in Bulgaria: ???????? ? ????????? ?? ???? ?????? I have been playing a great tennis game and I really enjoy it. You create your own player and play against other players from all over the world. Join in, you won’t regret it! ???? ???????? ?, ???????? ?? ??????? ?? ????? ?? ??????? ????????? ????????, ? ???? ?? ?????? ?? ??? ? ???? ? ?????????? ??????????? ?? ????? ?? ????. ????? 4 ?????? ?? ???? ?????? ????? ????????? ?????? ?, ??????? ?? ??? ????????? ????? ?, ???? ?????? ?? ?????????? ? ???? ?, ????? ? ???????? ?? ????? ??? ??? ??????????? ?? ???????. ???? ???? ????? ????????? ??????????? ?? ?? ?? ??????? ? ????????? ??? 43 ????????????. ”14 ?????? ??????? ????????? ?? ??? ?”, ???????? ???? ?. “??????? ?” ??????? ?? ???? ?, ?????????? ?? ????? ????????? ?? “?????????? ?” ?? ????? ???????? ??????? ????. ?????????? ?? ?????? ???? ????? ?? ?????????? ?? ????? ???? – ????? ????? ? ????????? ??. ??????? ?? ?????? ?? 31 ?????? 1998 ?????? ? ???? ?? ? ?????????? ???? ???????. ?????? ??????????? ??? ?, ??????? ?? ????? ???????? ??????? – ????? ???? ?, ???????? ? ?????? ?? ????? ?, ?? ?? ?? ??????. ?????? ?????? ????? ? ????? ?, ?? ?????????? ?? ??????? ?? ?????? ???????? ?, ???????? ?? ?? ?????? ? ?????? ??. ?????? ????? ????????? ?? ???? ?? 11 ? 16 ??????. ????????? ????? ???????? ???? ?, ???? ????? ?? ???????? ??? ????????? ??. “???????? ?? ?? ?? ?????? ?, ?????? ?? ??????? ? ??????? ? ?????? ? ???? ?? ?, ???????? ?? ?? ?????? ? ?, ?? ?? ?????? : ”???? ?? ????? ?, ????? ?? ?? ??? ?, ???? ???? ?, ?? ???? ?? ?? ??? ?.” ????? ?????????? ? ??????? ? ??????????. ??????? ?? ???? ?????? ???????? – ??? ?????? ? ??????? , ??????? ????? ? ????????? ????? ?, ?????? ??????? ?? ????? ?????????? ??? ?, ???? „????????“. ?? ????? ?, ?? ??? ? ????? ?? ???? ?, ????? ?? ????????? ????? ????? ???????????, ? ?????? ? ??????? ???????.
? ???? ?????? ?? ???????? ??????? ???? ????? ???????? ?, ???? ?? ???? ????? ????? ?? ???????? ?? ???????????? ?????? ??????? ???????. ?? 16 ??? 2006 ?. ?? ?????? ????? ????? ?, ????? ???? 1996 ?????? ???????? ?????? ? ????????? ????? ??????? ??? ? ???? ? ?? ?????? ???? ?????????. ???????? ????? ???? ? ??????????? ?? 4 ?????? ? 8 ?????? ???????? ??? ???????? ?, ???? ???? ???? ????? ?????? ??????????? ??????? ?? ??????. ???? ???? ?? ??????????? ?????? ? ??????? ?? ???????? ? ? ???????? ????? ????????? ????? ???????? ?- ????????. ?? ?? ????? ?, ?? ?????? ???????? ?? ? ????????? ?? ?? ?????? ?? ????? ? ????. ????? ????? ??? ?, ?? ?? ????? ?? ??????????????? ???????????? ????? ??????? ?? ??? ??????????? ?? ??????? ?, ?? ?? ? ????????? ? ?????????? ????????????. ?????? ??? ???????? ?? ????????? ??????? ????? ?? ?????? ??. ?????????? ?? ??????????????? ? ?, ?? ?? ???????, ? ???? ?? ???????? ????? ???? ??????? ?????? ??????????. ????? ????? ??? ?, ?? ?? ???? ????? ?????????????? ?????? ? ???????? ????????????? ?? ?????????? ?????????? ?? ?????????? ??????????? ?, ?? ?? ?????????? ????????? ???????? ?? ????????? ????. Besides that, the last president who named the 3 judges is the current suspended one, Traian Basescu. It’s pathetic! More nice words from Romanian politicians which won’t be backed up by actions. It has been more than 5 years since the monitoring mechanism started, and yet Romania still needs to be told to “make integrity a political priority” and “respect the full independence of the judiciary”?! Hasn’t Romania progressed at all? I think the European Parliament or the European Commission needs to take far more drastic action to solve Romania’s corruption problems, rather than just writing reports which have no effect. At least the German MEPs have a good idea by the sound of it!